The latest release on John Johnson’s 238W Inc. welcomes Jesse Oliver back to the label for a brand new single. The Finnish artist is making his fifth appearance on the label following his ‘Savage Wish’ single from February of this year. 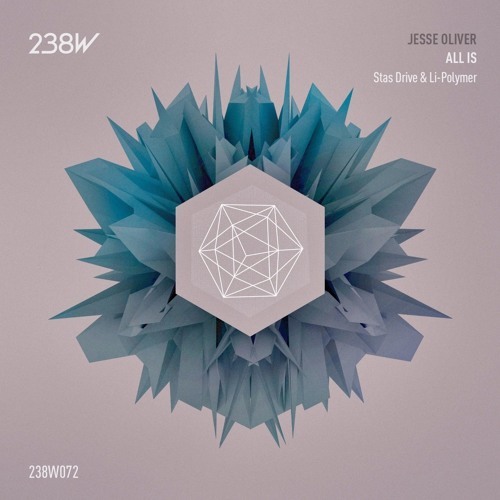 Jesse’s latest is entitled ‘All Is’ and comes alongside remixes from Stas Drive and Li-Polymer. For those that follow 238W Inc. you know their last single from Jesse was a distinctive, chuggy number. On ‘All Is’ we get something a bit deeper but every bit as catchy as ‘Savage Wish’. Dark beginnings lead to strong tonal themes and ethereal vocal motifs all while waves of electronics tease the senses. Following an intense first act the track breaks down for a brief interlude where the underlying piano finally gets to shine momentarily. There isn’t much tension relief though as the piercing tones continue on their rollercoaster-like cascade into the dark depths of the night. Brilliant work from Jesse. There have been few labels releasing on a weekly basis that can boast the remixer selection that 238W Inc. has. John Johnson seems unrelenting in his quest for greatness as each release offers some pretty spectacular talent. Leading the way here is Stas Drive who provides two interpretations. Fresh off a contribution to Chapter 24’s ‘Seven Stories’ collection the Ukrainian artist takes ‘All Is’ into his own mystical electronic playground. Sonically deconstructed, the lead motif takes on an entirely different feel here. Quite cosmic in design and well complemented with vocal drifts and gnarly textures. Timely drum fills add nicely to the tracks energetic pull but it’s the well crafted break that ultimately seals it’s brilliance in the end. If you love cutting electronics then prepare to get eaten alive by this one. Massive remix from Stas. Also included is his tamer and more groove oriented pres. Quattar interpretation. There’s still a modern growl attached to this one but a much more light-hearted back drop paints an entirely different and equally thought provoking picture. Also bringing greatness is Portugal’s Li-Polymer who makes his second appearance on 238W Inc. After having remixed Groven & Naz for the label in March of this year Li-Polymer went on to deliver outstanding work for Movement Recordings and One Of A Kind. Much like Stas Drive, Li-Polymer has slowly reinvented himself over the last year with a different and more unique approach to production. For his ‘All Is’ interpretation we see him sticking quite close to the main theme from the original while radically revamping the framework for a more minimalistic feel. There’s a slow brooding quality to this, particularly in the first 3-4 minutes with an acid-like growl and elusive feel. It sets a wonderful mood before the true rhythmic power of the track gets a hold of you. Whereas the original goes quite big and bold with the lead theme Li-Polymer brings a softer yet still very striking rendition of it. Another great production from an artist having an incredible year and a top notch release from John Johnson’s 238W Inc. Don’t miss it.